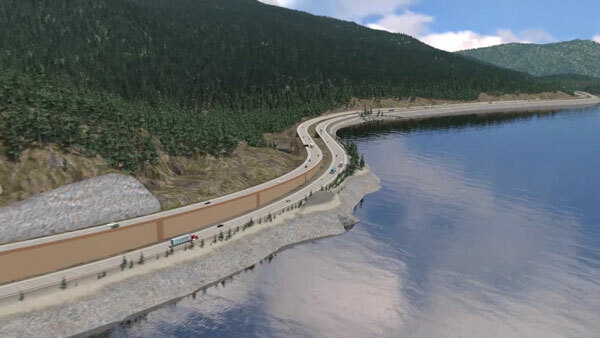 When the Washington State Department of Transportation perceived the need for the I-90 Snoqualmie Pass East improvement project, it turned to its Visual Engineering Resource Group for help visualizing the $551 million project and gaining funding approval. VERG created a series of animated videos of what the pass could look like. 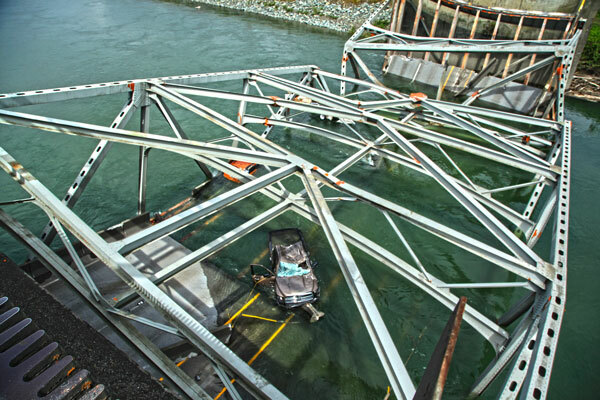 When an oversized semi-truck hit a portal on the Skagit River Bridge—dropping vehicles and a span of the bridge into the water—the state’s governor and transportation secretary tapped VERG to visually document the incident with still and video photography for potential litigation purposes. 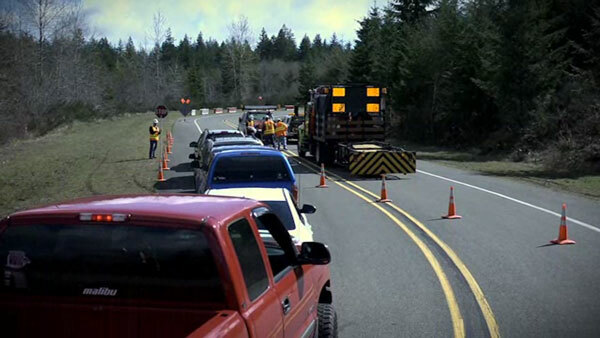 When the Washington State DOT needed to communicate the importance of work zone safety to drivers and workers, the department sought VERG’s help in the form of a video to deliver the message. Video: VERG created an animated view of what Snoqualmie Pass improvements would look like. Conceived in 1992 as a Design Visualization Group, VERG has since morphed into an in-house group of four visual communication engineers who pride themselves on providing the right product at the right time for the right reasons. Steve Lee, Kurt Stiles, Ron Jones and Keith Anderson make up Washington’s VERG team. VERG provides 3-D modeling, video production and digital photography to project engineers, program managers, executives and other decision makers inside and outside the DOT. With these tools, they can strategically engage with stakeholders for education, confidence building and consent, leading to project and program growth. VERG also provides products to meet communication needs for WSDOT and its partners. Stiles explained 3-D modeling, a skill honed by VERG’s Ron Jones. “Civil infrastructure is communicated through the 3-D model, and that is done in a still image format or animation. These computer models give an accurate and clairvoyant view as to what the infrastructure is going to look like—its access issues, how it exists, its context sensitivity and even whether the transportation facility in question is viable,” said Stiles. Video: VERG told a story in video form to encourage work zone safety. Another product is video production. In recent years, visual production equipment has become digital, and it’s much smaller than in the days of film splicing and editing. “If you have a pretty robust computer and a basic high-definition video camera, some basic lighting and a few different microphones, the only thing that’s stopping you from telling great stories is your creativity in putting all of it together,” said Stiles. VERG also provides commercial-quality digital photography, a specialty headed by Keith Anderson. 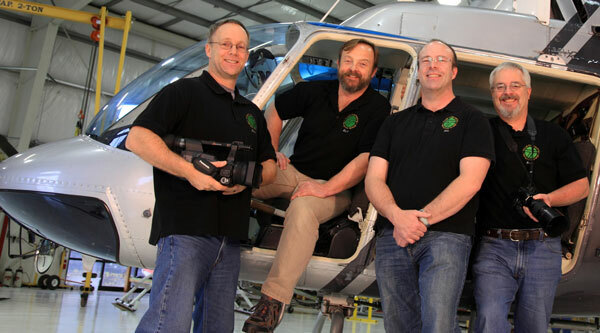 An aerial perspective is often key to telling a transportation story, Stiles said, and VERG is expert in providing boom truck as well as rotary and fixed wing aircraft imagery. Good photos are available from many sources, but VERG provides imagery created with in-depth knowledge of the engineering subject matter. High-quality digital photography provides images for visualization—as a basis for 3-D modeling. Many still image visualization products are based on digital photography of the real world. Other applications include project documentation, award submittals, cultural resources mitigation, executive portraits, litigation and emergency situation documentation. 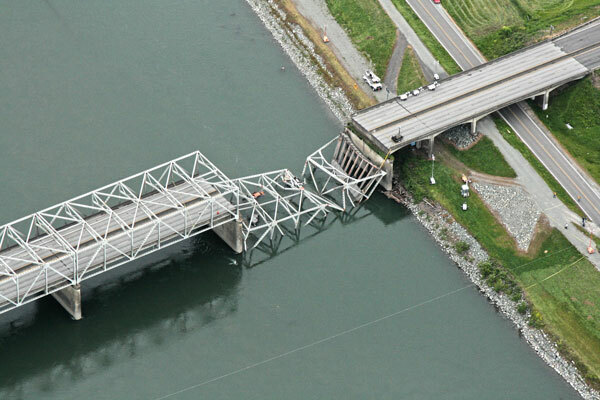 In 2013, VERG staff shot the Skagit River Bridge immediately after its collapse with professional-level digital single-lens reflex cameras and high-definition video cameras. “A DOT needs to have skilled people on call who are ready to do this, not come up with the ability last minute,” Stiles said. 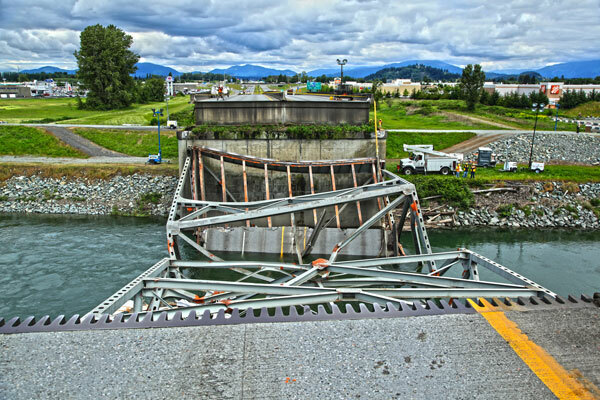 (Photos) VERG moved quickly to document Skagit River Bridge damage. Starting a visual engineering resource group like the Washington State DOT’s might seem intimidating, but gaining the empowering abilities of visual communication is worth it, according to Kurt Stiles. He recommends that DOTs keep VERG staff in-house for better control of messages and costs. In 2013, Washington’s VERG helped the Georgia Department of Transportation launch its own VERG. Start by developing 3-D modeling skills with engineering staff based in the DOT’s computer-aided design system, Stiles said. First learn still image visualization techniques, then move on to animation. In time, bring in video software to augment the delivery of the message from scripted animations, Stiles advised. Tell a story with the modeling. Learn about telling stories with words, then migrate to using video. Obtain some basic equipment—software, cameras, microphones and lighting. Either hire a videographer or train one from talent inside the DOT. A VERG and its products can help people make decisions faster and with better insight, Stiles said. For more information about starting a VERG in a DOT, contact Stiles at (360) 709-8008. As part of the Strategic Highway Research Program 2 and Every Day Counts initiative, more than 50,000 public safety professionals have been trained in traffic incident response skills. And when that milestone was achieved six months early in June, the Federal Highway Administration issued a new challenge: train 100,000 emergency responders by the end of 2014. The nation’s first multidisciplinary traffic incident management responder training program, the effort focuses on disseminating best practices for handling incidents on highways to protect motorists and first responders while minimizing the impact on traffic flow. Traffic incident management approaches covered in the training include detecting and responding to incidents, clearing incident scenes safely and quickly, and restoring traffic flow. First responders undergoing TIM training represent a variety of disciplines, including law enforcement, fire departments, transportation agencies, emergency medical services, public safety, towing and recovery, public works and hazardous materials operations. “Being able to train 50,000 people who respond to highway incidents is really a fantastic number when you consider the large differences across the country in how people respond and how people train,” said Mark Light, CEO and executive director, International Association of Fire Chiefs. The group is one of FHWA’s partner organizations in the training effort, along with the National Volunteer Fire Council, the Towing and Recovery Association of America, the National Association of State EMS Officials and others. Top officials of the partner groups stress that TIM training will make incident response safer for both first responders and the traveling public. This year, an average of more than one towing person per week will be killed while responding to a traffic incident, said Cynthia Martineau, executive director of the Towing and Recovery Association of America. Dia Gainor, executive director of the National Association of State EMS Officials, called the 50,000 milestone a “great down payment on the 1 million target” of total responders who need the training. “There are about 925,000 EMS personnel and paramedics out there who can use the training,” said Gainor. EMS personnel or volunteer firefighters may work alone as first responders to an incident, so they can make especially good use of the training, said officials from both groups. Because of the rural nature of most volunteer fire companies, volunteers often reach the scene before law enforcement officers do, said Allen Metheny, secretary-treasurer of the National Volunteer Fire Council and director of the Delaware Volunteer Firefighters Association. “Struck-by incidents are the leading cause of death for law enforcement officers, not felonious assaults,” said Robert Maynard of the International Association of Chiefs of Police, who is also chief of the California Highway Patrol Enforcement and Planning Division. TIM training will greatly reduce the number of secondary crashes at an incident scene and help get the scenes cleared more quickly, he said. The Michigan Department of Transportation and FHWA showcased innovative bridge technologies at summer events. One demonstrated the use of geosynthetic reinforced soil integrated bridge system technology at the Keefer Highway Bridge in Ionia County. The project is Michigan’s first to use GRS-IBS technology to reduce construction impact on road users. The other event offered participants the opportunity to watch slide-in bridge technology in progress on U.S. 131 and M-50 in Grand Rapids. “The bridge slide showcase was a good opportunity to gain more information that will help us use this technique in the future,” said Adam Price, transportation project specialist with the Tennessee Department of Transportation. The Ohio Department of Transportation will use the Safety EdgeSM in a new way: to cut crashes in interstate work zones. The agency has required the paving technique on resurfacing projects on undivided highways since 2012. It’s now looking to reduce roadway departure crashes on interstate reconstruction projects by adding a Safety Edge when an intermediate asphalt course will be exposed to traffic. The Safety Edge will be used first on an on I-71 project in Morrow County. The project is in its second season, so crash and safety hardware replacement cost data will be compared to first-season data to gauge the technique’s effectiveness. Representatives of the Rhode Island Department of Transportation—along with federal, state and local officials—broke ground on the Apponaug Circulator project in Warwick. The $29.9 million project will introduce modern roundabouts and other traffic safety enhancements as well as realign roadways to relieve traffic congestion in the area. The project will convert five intersections to roundabouts to reduce crashes. It also includes 1,100 feet of new road that will serve as a bypass for through traffic, allowing the city to pursue long-range redevelopment plans. The U.S Department of Transportation has approved six projects for more than $4 million in grants from the Federal Highway Administration’s Accelerated Innovation Deployment Demonstration program. The projects are the first to receive grants under the program, which ultimately will provide $30 million in incentive funding for federal, state, local and tribal agencies to hasten their use of innovative technologies. 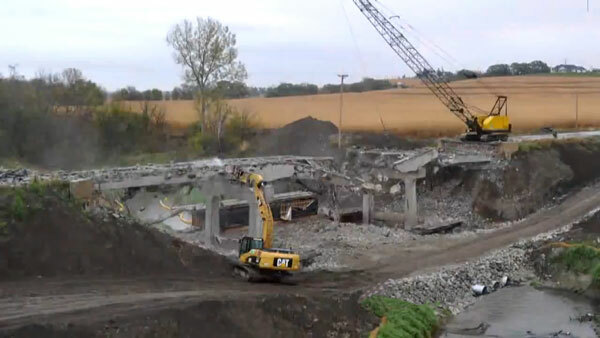 Video: The Iowa DOT, which received AID Demonstration funds for an innovative bridge project, used accelerated bridge construction when it replaced the Keg Creek Bridge. Grants awarded under the AID Demonstration program are not limited to innovations promoted under FHWA’s Every Day Counts initiative to accelerate innovation deployment and cut project delivery times. The money can be used for any proven highway innovation an agency does not use routinely, but plans to adopt to improve its practices. Grants also are not limited to construction projects. They can be used for any aspect of highway transportation, including planning, financing, environment, design, construction, materials, pavements, structures and operations. The Alabama Department of Transportation will use AID Demonstration funds on slide-in bridge technology to reduce detoured traffic time during construction of twin Ross Clark Circle Bridges over Beaver Creek near Dothan. The agency will build two single-span bridges, one per traffic direction, next to the road under live traffic. Once the super- and substructures are complete, the new bridges will be slid transversely into place. The Alabama DOT and the city of Auburn received a grant to use prefabricated bridge elements and systems on the Moore’s Mill Road Bridge replacement project. The project is expected to give contractors experience with larger scale PBES construction, as well as ensure a more controlled environment for fabrication of the aesthetically enhanced bent elements. The Iowa Department of Transportation’s grant will help the agency use accelerated bridge construction technologies that advance the modular design concept, including prefabricated elements and high-performance materials. The project—the replacement of a bridge on Iowa 92 over Little Silver Creek in Pottawattamie County—includes ultra-high performance concrete and stainless steel deck reinforcement. Using the innovative technologies will enable the Iowa DOT to adopt improvements based on experience it gained from earlier ABC use. The Oklahoma Department of Transportation plans to use a grant to apply high-friction surface treatments in three locations on high-volume interstate roads in the Oklahoma City area. The grant is expected to provide the department with the necessary experience to institutionalize the use of HFST and deploy it across the state in safety-critical locations. The use of HFST is expected to reduce crashes without resorting to the less-cost-effective option of a thicker overlay, which would alter the highway’s geometry. The U.S. Forest Service will use a grant to deploy two innovative technologies at the Gifford Pinchot National Forest Layout Creek Bridge in southwest Washington. 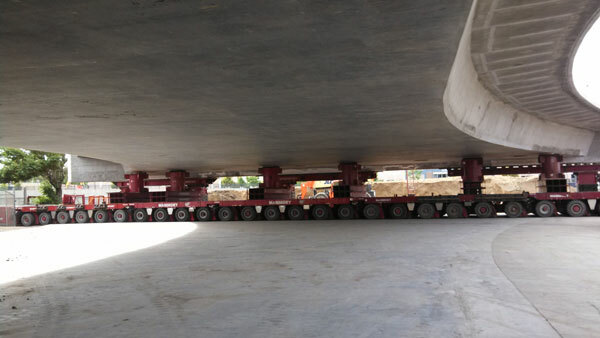 The substructure was designed using geosynthetic reinforced soil integrated bridge system technology, and the superstructure was designed with prefabricated prestressed concrete beams. Benefits include time and money savings, flexible design, increased constructability, safety advantages and reduced environmental impact. A grant to the Vermont Agency of Transportation will also help the New Hampshire Department of Transportation and Maine Department of Transportation work collaboratively to implement an advanced transportation management and traveler information system. The system will allow the agencies to monitor and share transportation data and manage infrastructure and intelligent traffic devices, as well as provide traveler information services to the public. Every Day Counts, the Federal Highway Administration’s initiative to encourage widespread use of proven innovations, is having a positive effect on the highway community’s adoption of new technologies and practices. Since Every Day Counts was launched in 2009, every state transportation agency has used two or more of the innovations promoted under the initiative. Several of those innovations are now standard practices in many states, enhancing the highway system and benefiting travelers. Every Day Counts has helped states accelerate adoption of innovations such as intersection and interchange geometrics (left) and warm-mix asphalt (right). Every Day Counts uses a state-based approach to innovation deployment. FHWA collaborates with the nation’s transportation professionals to identify a new set of technologies and practices to champion every two years. The innovations focus on shortening the project delivery process, improving environmental sustainability and enhancing roadway safety. Stakeholders in each state pick the innovations that best fit the state’s needs. FHWA provides expert teams and resources, including the Accelerated Innovation Deployment Demonstration and State Transportation Innovation Council Incentive programs, to help states implement their chosen innovations. 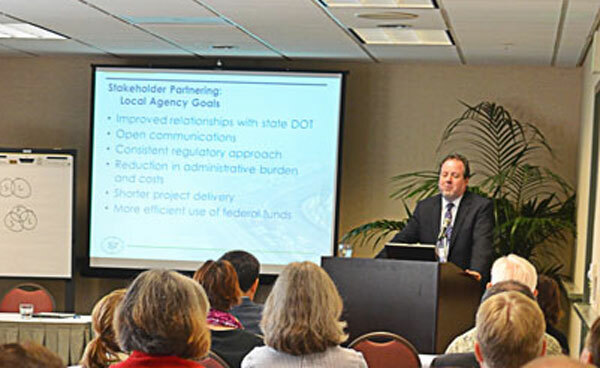 Brian Roberts, executive director of the National Association of County Engineers, makes a presentation during the stakeholder partnering session at the EDC-3 Summit in Sacramento, California. One Every Day Counts innovation spreading across the country is accelerated bridge construction, technologies that allow for faster construction of bridges, significantly reducing traffic delays and road closures and often cutting projects costs. Since 2010, highway agencies have designed or built more than 2,500 replacement bridges using ABC. 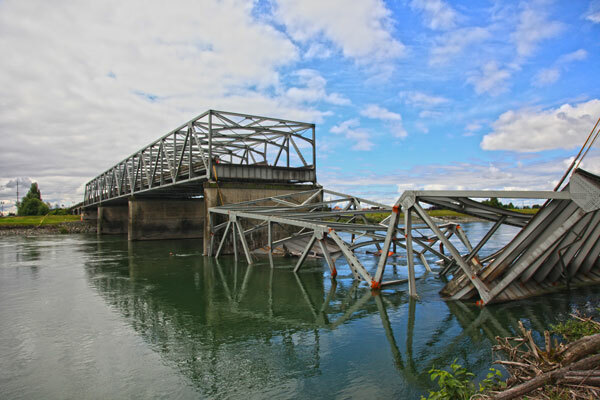 An example is the I-5 Skagit River Bridge, which the Washington State Department of Transportation replaced in three months when it collapsed after being hit by a truck. Traffic moved on temporary bridges while the new bridge was built next to the original alignment. Over one night, crews removed the temporary bridges and slid the new one into place. Programmatic agreements are helping states establish streamlined processes for handling routine environmental requirements on many projects, reducing review times and accelerating project delivery. Thirty-seven states have at least two programmatic agreements in place. The Nebraska Department of Transportation has nine programmatic agreements that address environmental compliance. Those agreements have helped streamline 712 projects since 2010. Several states use the construction manager/general contractor project delivery method, in which the project owner hires a contractor during the design phase to propose innovations and provide constructability advice to allow for faster and cheaper construction. Using CM/GC enabled Multnomah County in Oregon to save $25 million and complete the Sellwood Bridge project a year earlier than if it used conventional construction methods. Forty-one state transportation departments and all Federal Lands Highway divisions now have specifications or contractual language allowing the use of energy-saving warm-mix asphalt, which is produced and placed at lower temperatures than traditional hot-mix asphalt. From 2009 to 2013, WMA saved an estimated $600 million on fuel used for production. In 2013, it reduced CO2 emissions by an estimated 2 million tons. Every Day Counts has encouraged widespread use of accelerated bridge construction techniques. The California Department of Transportation, which adopted a WMA specification in 2011, is one of the largest-volume WMA users in the nation. The Virginia Department of Transportation considers WMA its fastest Every Day Counts adoption story. By 2011, 75 percent of the asphalt used on Virginia’s state roads was WMA. More than 100 highway agencies now use adaptive signal control technology, which adjusts the timing of traffic lights to accommodate changing traffic patterns and ease congestion. That’s reducing fuel consumption and saving time for drivers. About 1,200 ASCT signals have been installed in Delaware, 900 by the Delaware Department of Transportation and the rest by the city of Wilmington. Delaware plans to have a statewide system by 2015. 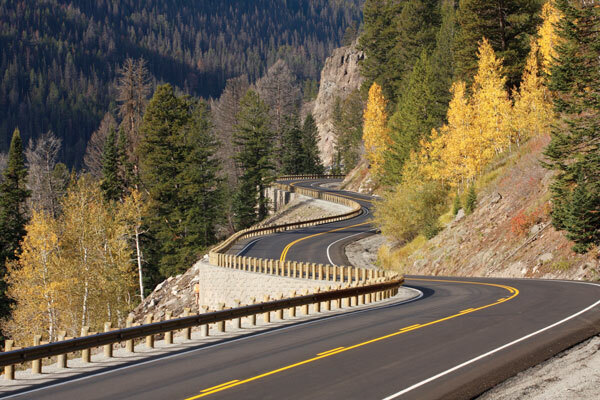 More than half of states use high-friction surface treatments, which are applied to pavements to provide more surface friction at critical locations, such as sharp horizontal curves, steep hills and intersections. The treatments can help motorists maintain control and reduce crashes. The Pennsylvania Department of Transportation reports a before-and-after crash reduction of 100 percent for its HFST projects over the three to five years after installation. Also seeing strong acceptance across the country is the diverging diamond interchange, which enhances safety and traffic flow by shifting crossroad traffic to the left side of the road between ramp intersections to eliminate the left turn at a traffic signal. 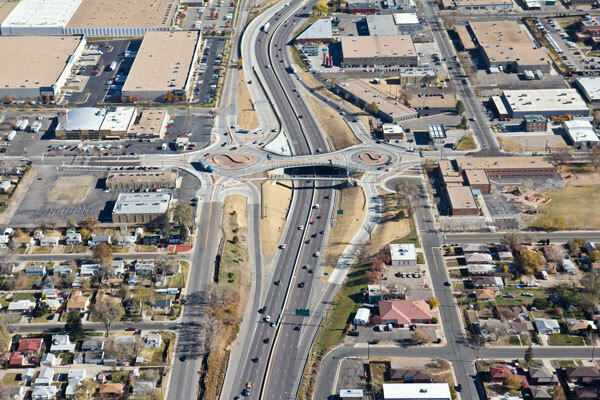 The Colorado Department of Transportation and the city of Grand Junction built a DDI that doubled the capacity for left turns and saved 70 percent over the cost of interchange alternatives. National traffic incident management responder training, also a Strategic Highway Research Program 2 priority, is advancing a multidisciplinary training program for handling highway incidents. It focuses on strategies to minimize the impact of incidents on traffic flow and enhance the safety of motorists and responders. So far, more than 50,000 first responders have been trained across the country, including 10,000 in Ohio alone. Through Every Day Counts, the transportation community is establishing a foundation for a culture committed to using innovation and making it an everyday practice in planning, building, maintaining and operating the highway system. 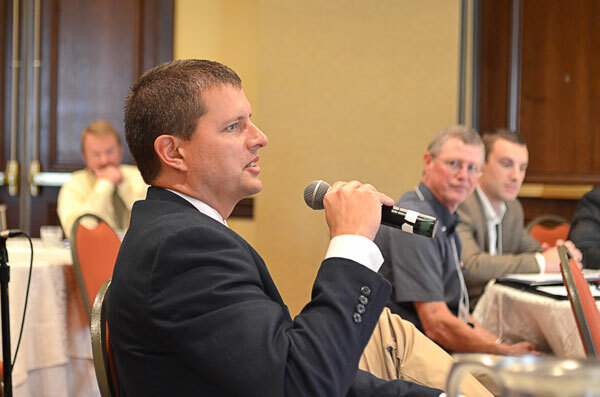 EDC-3 summit participants shared best practices and lessons learned on innovation deployment. State Transportation Innovation Councils are key contributors to the effort. They bring together stakeholders from throughout the transportation community to evaluate which innovations are most appropriate for the state. The nation’s 45 STICS are creating a network to exchange best practices for widespread use of innovation. The third round of Every Day Counts features 11 technologies and practices that can shorten the project delivery process, enhance safety and improve environmental sustainability. They range from efficient electronic tools and easy-to-build bridges to time-saving planning techniques and congestion-cutting work zones. FHWA will work with transportation agencies and their partners to deploy the innovations in 2015 and 2016.